We went on the 2nd Annual walk last weekend. I didn't make last year's and didn't want to miss it this year. It was tough deciding which one to go on. There were 15 strolls scheduled for Washington state and 4 in Seattle alone. We decided to do one of the walks a little further from home for a change of scenery so we went with Gig Harbor, Scott Bourne's home town. Unfortunately, Scott was off in Portland leading a stroll there. We had about 22 people show up for the walk. Marvin Nauman was our walk leader and gave us lots of subject matter to photograph. A few of us Flickr peeps showed up a little early and we walked around the area for a while before the official start of the stroll. 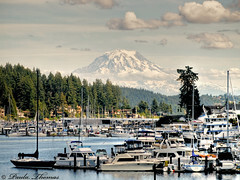 None of us had really spent any time in Gig Harbor so it was something new for all of us. Mt Rainier was out for us which is when I took this shot. Once the stroll started however the clouds started moving in and she didn't make her way back out for us so I'm glad I got this shot when I did. We went to Anthony's after the stroll for some drinks and eats. I had a margarita and some interesting nachos. They were Hawaii Ahi Nachos, Traditional Hawaiian poke with pineapple chutney served on taro chips with wasabi aioli. They were pretty good, but it was a pretty small portion compared to what you get when you order normal nachos. I look forward to the 3rd Annual Photowalk next year. I love this perspective on Mt. Rainier. Great image!